Cartilage and synovial fluid areconnective tissues found in the joint. Collagen type II, hyaluronic acid (HA), chondroitin sulfate are key protein and glycosaminoglycan (GAG) molecules to the cartilage, while HA plays an additional role asthe major lubricating molecule in the fluid. Unfortunately, aging and repeated strenuous sports activity is associated with the deterioration of these connective tissues leading to chronic joint discomfort. Similarly, natural and photoaging causes degradation of skin connective tissue called dermal extracellular matrix (ECM) where collagen and GAGs such as HA are key molecules. Their breakdownisan important event that makes the dermal layer disorganized to generate visible aging signs such as wrinkles and fine lines as well as dehydration. This deteriorating process underlying joint discomfort and skin aging can be safely and effectively addressed by BioCell Collagen®, an innovativedietary ingredientthat offersa comprehensive mechanism for re-stimulation of connective tissue cells as well as for replenishment of degraded collagen and GAGs. BioCell Collagen® is a patented ingredient which offers an ideal approach to complex joint problems. It is a naturally-occurring matrix of hydrolyzed collagen type II and low molecular weight (LMW) HA and chondroitin sulfate. Due to a proprietary BioOptimization™ process, these molecules are highly bioavailable and, once ingested, may help rebuild cartilage. Its safety and efficacy has been proven by multiple human clinical trials and also by the safe use of billions of doses by the consumer worldwide. BioCell Collagen®: A cartilage mirror. BioCell Collagen® provides a comprehensivesolution because its composition mirrors that of human cartilage. Intake of both collagen and GAGs would be more desirable for effective and long-term joint health than a partial approach of ingesting either collagen (e.g., undenatured collagen) or GAGs (e.g., glucosamine and/or chondroitin sulfate) only. 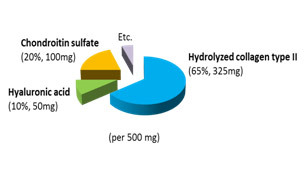 In addition, a patented process developed by BioCell Technology makes these cartilage molecules remarkably bioavailable for fast and effective absorption, as shown in a human bioavailability study.More importantly, unlike undenatured/unhydrolyzed collagen, hydrolyzed collagen type IIhas been shown to stimulate theproduction of collagen type II, suggestingpotential cartilage regeneration. Over the past decade, three human clinical trials proved the safety and efficacy of BioCell Collagen®in improving joint discomfort. 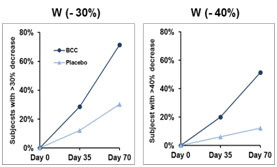 A recent double-blinded, placebo-controlled clinical trial, the outcome of which was published in the prestigious Journal of Agricultural and Food Chemistry, enrolled 80 subjects suffering from a progressed stage of joint discomfort and demonstrated that 71% of the subjects who ingested 2 g daily of BioCell Collagen® experienced at least 30% reduction of discomfort while 30% in the placebo had a similar effect. This outcome has confirmed a remarkable efficacy and safety of BioCell Collagen®, which was also observed in earlier clinical trials. Frost & Sullivan, a global marketing and research firm, recognized the innovation and strong scientific research of BioCell Collagen® with the prestigious 2011 Joint Ingredient of the Year award. BioCell Collagen® also helps counteract both natural and photoaging process in the skin via multiple mechanisms.First, it replenishes aging-dependent loss of both collagen and GAGs from skin dermis. Second, itlends an additional support for the integrity and healthy levels of HA as its intake (1500 mg/day) increases HA levels in the blood about 60 fold from its baseline. Third, BioCell Collagen® inhibits HA-degrading enzyme, hyaluronidases, helping maintain the integrity of HA. A human skin study (2011) enrolling 26 ladies demonstrated that daily ingestion of 1 g of BioCell Collagen® for 12 weeks led to a significant reduction of wrinkle counts and line depth while enhancing hydration, type I collagen content, and blood microcirculation. This outcomedemonstrated that BioCell Collagen® could stimulate diverse mechanisms for reduction of visible aging signs in the face.